You record your X-sports video during surfing with newly-bought GoPro Hero 7 Black and keep video length around 40-50 minutes in 1080p 60FPS. Yet, you're surprised to find that the 15-min video footage far exceeds the average level, almost 4GB in size after you split this GoPro video into 3 clips. This is troublesome. Though you're allowed to upload this large-sized GoPro video to YouTube, it seemingly takes forever to finish this task. What's worse, you'll be excluded by Instagram, Vevo, Dailymotion, etc. to upload GoPro oversized files, for your GoPro video source goes well beyond their upload size limits. Well, how to successfully yet quickly upload GoPro 4K/2.7K/2K/1080p/720p video to YouTube, Instagram and more sites? Reduce GoPro video size. Failed to Upload Big-sized GoPro to YouTube Instagram? Best GoPro video compressor to reduce GoPro 4K/2K/HD video without losing quality. 1. Cut off unwanted parts from GoPro video; split a long video into shorter segments. 2. Transcode GoPro 4K H264 to HEVC with 64% size off while keeping original quality. 3. Trim GoPro video to 3-60 seconds for Ins, 10 seconds for Snapchat and 2 mins for Twitter. 4. Properly lower 4K to 1080p, 2.7K to 2K, 80Mbps to 66Mbps, 60FPS to 30FPS to compress video. merge, brighten, add subtitles, speed up (16x)/slow down (10x), fix A/V out of sync issue, etc. 1. 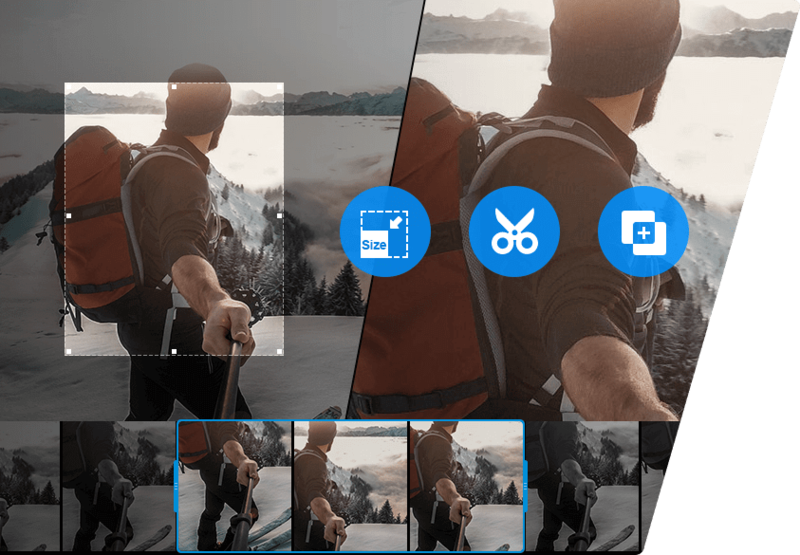 Edit GoPro video: enable "Trim" to cut off unwanted GoPro video clips to shorten its length; use "Split" to split GoPro video to several clips; activate "Crop" feature to remove black borders from video image to get rid of the unnecessary image pixels. This GoPro video compression method comes at no price of quality. 2. Transcode GoPro video: convert GoPro 4K/2.7K/2K/1080p/720p video from Hero 7/6/5 H264 to HEVC, WMV, FLV, 3GP, RMVB, etc. SNS sites supported formats with higher compression efficiency, size being 50% - 66% smaller. 3. Adjust GoPro video parameter settings: lower GoPro video resolution from 4K 2160p/3000p to 1080p, 1440p/1080p to 720p, change video frame rate from 60FPS to 30FPS, slow motion 240FPS to 120FPS and tweak Bit rate from 80mbps to 66mbps, 47mbps to 33mbps. Prior to cutting to the chase, please head to VideoProc official website to free download VideoProc on your Windows or macOS. And you're strongly suggested to do the GoPro video reduction task on a comparatively high-end desktop powered by Intel QSV/Nvidia/AMD GPU hardware acceleration tech, which can be activated by VideoProc and used to process your GoPro 4K 60fps/50fps large-sized video compression task mainly on GPU processor to relieve CPU from overuse/overheating problems and quicken GoPro 4K/1080p video processing speed up to 5X faster. Well, after the downloading is finished, install and fire it up on your computer. Now let's go back to the point to make GoPro video smaller. Step 1. Import GoPro video to VideoProc. Tap "Video" on the pop-up home screen of the program > click "Add Video" to opt for the GoPro Hero 7/6/5 Black files from your desktop and hit "Open". Or, you just drag and drop GoPro files into the interface. For those who have a batch of GoPro 4K/1080p files to be resized, you don't have to add files one by one. Instead, just batch import dozens of GoPro files into it at one stroke. Step 2. Edit GoPro video to downsize file. To reduce GoPro 4K/2.7K/2K/1080p video size, cut and crop features are at your disposal to customize your GoPro video duration to fit the length limits of YouTube, Instagram, etc. Before doing so, you might need the video length requirements of top video sharing sites for reference. * Cut: click the scissor-shaped icon on the video info display bar and you'll be directed to the video editing window, where you can drag the green knob to freely set up the video start/end time to trim GoPro video duration. This would reduce GoPro video size to a large extent, mainly based on the video length you keep. * Crop: enable "Crop" option and the marquee can be available for you to freely narrow the image size and remove the unwanted borders from video image. * Split: head to "Toolbox" and select "Split", with which you are able to averagely split a large-sized GoPro video into several segments via numbers or video duration. Thus, you can averagely split GoPro video every 60 seconds for Instagram uploading without deleting any footages from video. Note: As you can see from the above picture, you're able to take full use of other features to polish your GoPro recordings before uploading under "Toolbox" category. For instance, tap "Deshake" to stabilize shaky GoPro video, "Denoise" to get rid of background/white noise from GoPro footages and "Rotate" to fix GoPro sideway/upside-down videos issue. More features (video to GIF, merge, flip, watermark, subtitle, effects, fisyeye correction, brighten...) are also available. Step 3. Convert GoPro video codec to shrink size. Move your mouse to the bottom of the main interface, where you're able to select the output format under "Video" category. For more output formats, tap "Target Format" icon to make the output profiles pop-up. 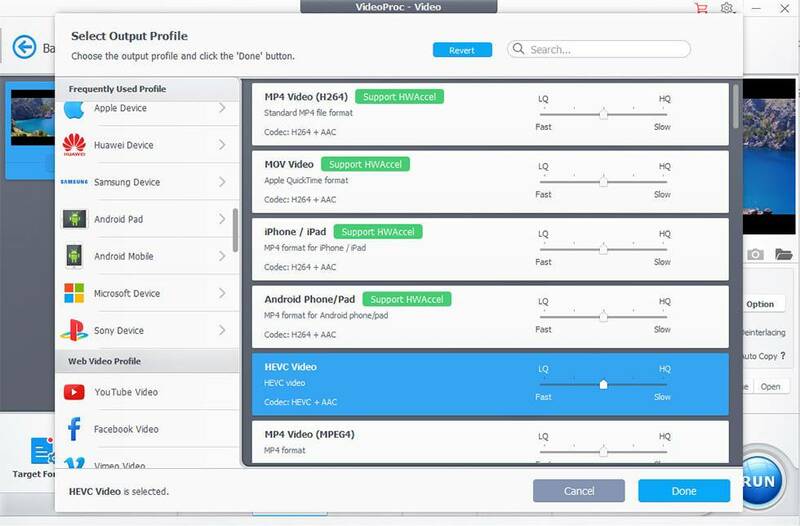 With 420+ preset profiles, you're allowed to transcode GoPro big-sized 4K video/slo-mo video to HEVC, MOV, MKV, FLV, WMV, 3GP, WebM, AVI or directly choose web video profiles (YouTube, Facebook, Vimeo, General Web Video incl.) with higher compression efficiency and highest possible quality (High Quality Engine). If you have no idea about the video upload limits for YouTube, Instagram or other sites, the following table and tips might be helpful. 1. 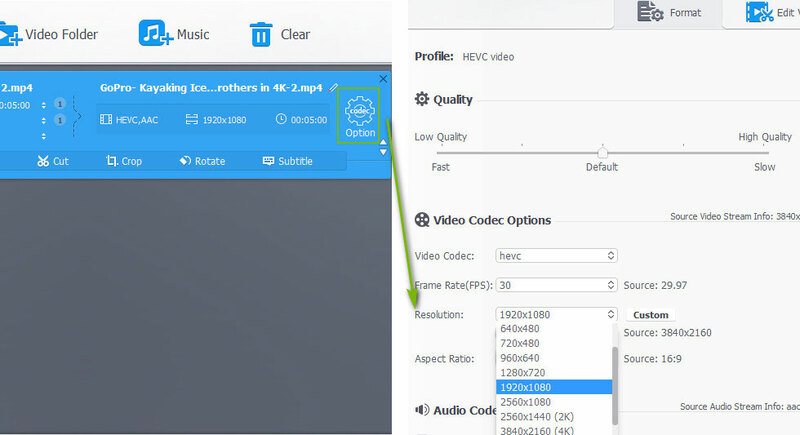 To upload large-sized GoPro 4K/2.7K/1440p/1080p video to YouTube/Vimeo/Dailymotion, it's highly recommended to use HEVC codec, which has been proven to deliver around 62% bitrate savings at 1080p and 64% bitrate savings at 4K 2160p when compared to H.264. More importantly, the higher compression efficiency HEVC brings doesn't come at any cost of quality. 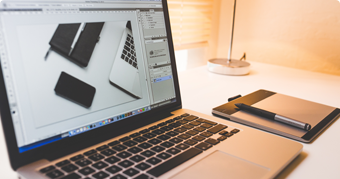 You can get the equally same or even better quality contrasted with H264. 2. At the touch of Instagram video uploading, it mainly depends on the video resolution and bit rate of your GoPro videos. For the GoPro Hero 5 Black recorded video at 480p/720p with 30/45Mbps, you're advised to choose VP8 codec, which is almost identical to H264 in video quality while saving 72% bitrate. For the GoPro Hero 6 Black shot 4K/2.7K/1440p/1080p videos, H264 outperforms VP8 in every single aspect. 3. On top of the common H264, HEVC and VP8, other video formats like FLV, 3GP, WMV, WebM are also excellent in video reduction and widely supported by most SNS platforms. Yet, it's a zero-sum game. 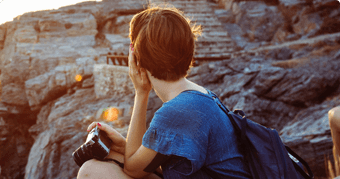 You win smaller file size and lose video quality if you opt for one of them. 4. Vimeo prefers High Profile H264 encoded video for uploading. If your original GoPro video is shot at H264 baseline or main, it doesn't matter. This GoPro video processing software provides you with the High Profile H264 option under Codec Option. Step 4. Tweak GoPro video parameter settings to resize file. Video encoding settings also have a significant influence on your GoPro file size. It covers video resolution, frame rate and bit rate. For the newbies who have little or no knowledge on how to adjust video parameter settings, you'd better have a check on the detailed setting requirements of each video site. Certainly, scroll down to where it says "let's get started" if you're not interested in my rant. Now you can start to adjust your GoPro video settings grounded on the video site you wanna upload video to. Let's get started. Head to the main interface and tap "Codec Option" at the video info display zone to enter video setting adjustment window. * Resolution: find resolution under Video Codec Option and lower your GoPro video resolution from 4K 3000p/2160p to 1080p/1440p, 1080p to 720p, etc. to meet the sites demand, as well as make GoPro video much smaller. * Frame Rate: higher in frame rate, larger in file size. To resize GoPro 4K/2.7K/2K/1080p video, you shouldn't ignore this setting. Generally, you can consider to change frame rate from 60FPS to 30FPS, 240FPS to 120FPS or even lower to downsize GoPro file. * Bit Rate: you'll be surprised to find that the bit rate reaches 80Mbps in your GoPro 4K 60FPS video with Protune effect. How large would it be in file size! Yet, to keep a good balance between file size and quality, bit rate adjustment is supposed to proceed within a certain range. Approximately 20%-40% lower is best. For instance, turn down GoPro 4K video from 80Mbps to 48/64Mbps. - Find "Bit Rate" under "Video Codec Options" and change default "Auto Calculate" into "Manual" from its dropdown menu. - The default setting of Auto Calculate is CBR (constant bit rate), which is a little bit lower than ABR in video quality. Opt for CBR or ABR at your disposal. Afterwards, change the "Target Bit Rate". For instance, to lower GoPro 4K video 66Mbps to 45Mbps, enter the number 46080 to the box. Tap "RUN" button and it will begin to compress and reduce GoPro video at Intel/Nvidia/AMD GPU accelerated speed, only 30% or less of CPU used, no CPU overheating/overuse problem. How Much Space Does Your 1-min GoPro Video Occupy? For those who don't wanna spend time and energy on resizing GoPro video or are weak in video compression, controlling your GoPro video size before shooting is much more suitable for you. Yet, how large a 1-min GoPro video will take up based on different video settings? Use a GoPro video size calculator to calculate GoPro file size or directly take a look at the below table to see the results. 1. To make GoPro video smaller in size, you can choose to turn off Protune if you're not high demanding on video quality. 2. As for GoPro 4K recording, the frame rate 60FPS is clearly superior to 30FPS, for GoPro Hero 6/7 Black automatically records 4K 60FPS video at HEVC codec with 64% size smaller than H264. 3. Which is better for GoPro Hero 7/6/5 slow motion video capture, 2.7K 120FPS or 1080p 240FPS? Well, from the above table, you can reach your conclusion - 2.7K 120FPS is preferred. If both are still too large to store on your 32GB GoPro, 1080p 120fps or 720p 240fps is also great. 1. Video Upload Length Limit [YouTube]: read to know more about YouTube video upload limits on video length and file size. 2. Recommended upload encoding settings [YouTube]: check to know the upload video settings YouTube suggests before uploading. 3. Technical Requirements for Ins Videos [Instagram]: abide by the Ins video requirements to create a new video for Instagram uploading. GoPro Video Audio Out of Sync Problem Fixed! GoPro Video Quality Enhancer Download Free! Check how VideoProc's full GPU accel benefits 4K video processing. Deshake GoPro 4K Clips - Easy! Follow the guide to stabilize shaky GoPro 4K footage at 1 click away. Protune on or off on GoPro Hero 6? Check the detailed protune settings.